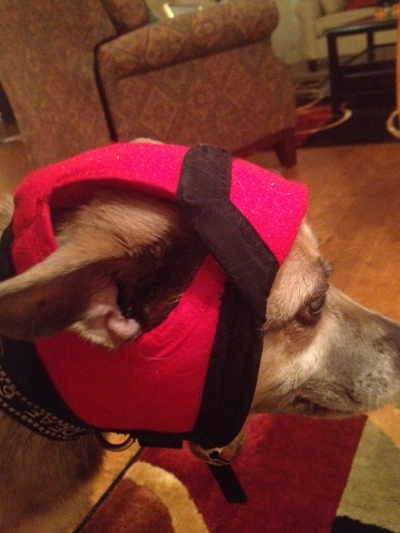 We are proud to introduce the improved design of our 'BUMPER HAT' (Protective Padded Headgear for 'Special Needs' Pets); specialty headgear lovingly created for dogs that are blind, have hydrocephalus, are prone to seizures, have neurological disorders, or have any other condition that could greatly benefit from having padded head protection. If your pet frequently (or even occasionally) bumps into furniture and walls, the protective casing can absorb the impact and minimize the pain. The hat section offers two to three middle layers of protection depending on the thickness. The protective rolled casing is completely removable and could be as thick and wide as needed for extra protection. The chinstrap is nylon webbing and secures with a sturdy release buckle. In addition, we created a back strap double D-ring assembly system that loops around your pet's collar to keep headgear in place. Therefore, we recommend your pet wear a collar with this headgear. If your pet uses a harness (with measurements you provide) we can customize the strap system to hook onto an existing D-ring or loop. Optional reflective nylon webbing, reflective fabric strip or small 'BLIND' letters are available by request. Our custom-made products are quality-hand made in the USA. Our headgear is made-to-order and can be ordered in sizes XS to XL. If interested in our headgear we ask that you please read and accept our DISCLAIMER prior to the ordering process. Click and complete 'Pet Measurements - Form 2'. If you experience any issues in submitting your information, please let us know immediately at info@missionpawsable.com. MISSION PAWSABLE initially made our very first protective padded headgear/hat with two little 'special needs' doggies in mind -- MOLLY (a blind Maltese) and CODY (a Yorkie with hydrocephalus). My dear friend, Gail Zeolla and her husband Tony are the guardians of these 'special' furbabies. 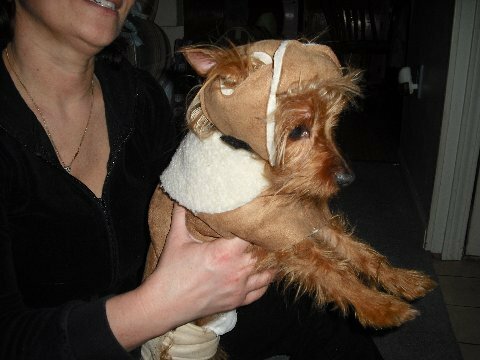 About a year or so later, I received an email from Dee Dee Murry who expressed an interest in our Sherpa hat but with a special custom request for a protective section around the face for her blind Dachshund HALLIE. After thinking about her custom request, I was able to put something together for her. Had to make a few adjustments and modifications here and there to make it properly fit her. Thus the birth of the 'Bumper Hat'! HALLIE (blind Dachshund) wearing her 'Bumper Hat'. HALLIE (blind Dachshund) wearing her 'Bumper Hat' (side view). HALLIE (blind Dachshund) wearing her 'Bumper Hat' (back view). 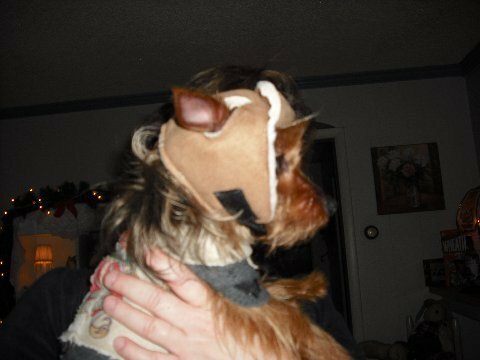 Just before the Christmas holiday, a dog trainer friend of mine (Joyce Hagan, owner of Dog Tutor LLC) contacted me regarding a project she had unrelated to the protective padded headgear. In our conversations, I learned that her dog SALSA suddenly went blind; she forwarded a video clip of her in the yard bumping into the exterior wall and I just had to make a 'Bumper Hat' for her! SALSA wearing her 'Bumper Hat' prior to her eye surgery. Side view of 'Bumper Hat' shows coverage area. Full side view of 'Bumper Hat' without the removable protective rolled casing. Top view 'Bumper Hat' without the removable protective rolled casing. Improved Design - 'BUMPER HAT' (Protective Padded Headgear). Improved design of our 'Bumper Hat' (right side view) on our model. 'Bumper Hat' (left side view) on our model. 'Bumper Hat' (back view strap system) on our model. MISSION PAWSABLE makes every effort to ensure that our custom products are functional, comfortable and above all safe to wear. The use of our protective padded headgear will reduce the impact absorbed when your pet bumps into furniture or walls when casually walking. The consumer is responsible for exercising reasonable safety and caution when using our headgear and should not abuse or alter the product. 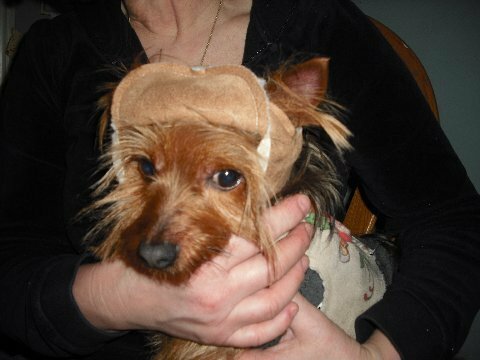 When putting headgear on your pet, make sure that the chinstrap is secure and comfortable, snug but not too tight. Do not leave headgear not monitored on any pet. 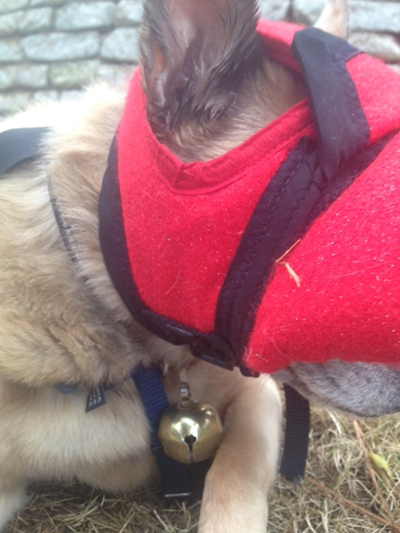 Please monitor your pet at all times while wearing any headgear, especially if they are first time wearers. MISSION PAWSABLE shall not be liable for injuries to your pet caused by improper use of our headgear or any of our products.